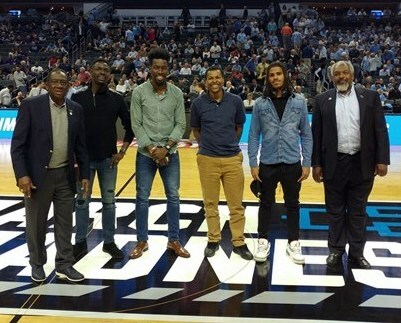 Shaquille Dill was one of the Saint Augustine's University Men's Track and Field team members honored at halftime of the University of North Carolina-Texas A&M University Men's Basketball Tournament game at the Spectrum Center. The Saint Augustine's University Men's Track and Field team were highlighted for winning the 2017 NCAA Division II Men's Outdoor Track and Field Championship in Bradenton, Fla., in May. A crowd of nearly 18,500 applauded the Track and Field Team, which stood at midcourt as its accomplishments were blared over the public address system. The Outdoor Title was the fifth in a row for the Saint Augustine's University Men. Overall, the Saint Augustine's University Track and Field Program has captured 39 NCAA Men's and Women's crowns under legendary Head Coach George Williams. "It is always great when our team is being recognized," said Williams, who has won the most NCAA track and field championships of any coach. "We really appreciate the NCAA for recognizing us. The kids really enjoyed the moment." The Saint Augustine's University Men's Track and Field team was represented by Dill, Taylor Eubanks, Jumonne Exeter, Shawn Rowe, Head Coach George Williams and Assistant Coach Sandy Chapman.